Geolocation API is there to provide your app with information on actual location of the device app is running on. In most cases its done in format of latitude and longitude. Location data is provided by mobile OS which is running on the device (it uses GPS and various network ID’s to crystallize this data). As per PhoneGap documentation, there is no guarantee that Geolocation API will provide your app with the current location data and this is important information to consider then you are designing your app. There should always be a fallback scenario in your code in case device will not return Geolocation data. How we are going to use the data? 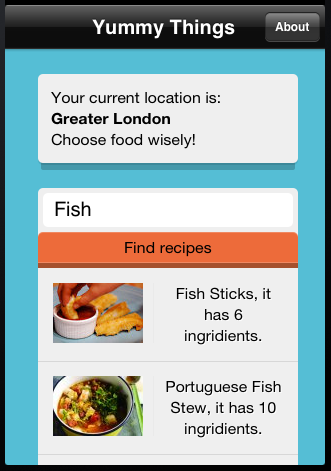 Well lets simply add a notification box over the recipes search field telling our app user where he currently is. Just to avoid disappointed app users who cannot buy the right ingredients in stores.. Jokes aside here is how we are going to implement it in our PhoneGap project. We need to translate these coordinates to the actual location name and maps.googleapis will help us to do that. As we already have php back end file serving us as communication service with 3rd party APIs (tutorial part 2) we are going to add few lines of code so it makes additional API call to maps.googleapis service which will give us back the name of location based on supplied coordinates. Above code is already commented out (Its a good habit to spend some time to comment what your code is doing. saves time in the long run). We first retrieve coordinates through PhoneGap API, next performing http get request to selected back end server (replace this url with the one of your server containing back end php script). On successful response we update <div id="locationplaceholder"> element in the main index.html interface file. If we fail to retrieve position coordinates from the device onError function just logs error to the console. You can perform more advanced actions in this place if needed. After launching application now we can see the our current location. Once application is launched in most cases the first initial screen your users will see will be splash screen. As developer you can enable or disable this screen in your projects. Sometimes you will need it to be displayed for a longer then default time frame. In PhoneGap projects Splash screen is shown by default so you just have to replace default image files in Resources/splash project directory. For our project I have just replaced default PhoneGap image to the Yummy Things splash screen image. I have also replaced mobile application icon (for standard and retina displays) in Resources/icons project directory. These are the icons your users will see on their mobile home screens. Application icons are one of the main criteria for users to select application from app store. Make sure it stands out. 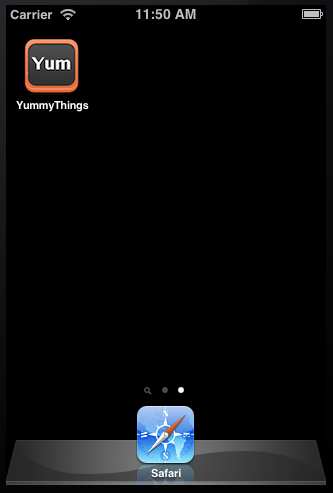 As for Yummy Things I quickly created simple icon with Yum on it. Now once install on the simulator or iOS powered device our application has custom icon and splash screen. With this done we can call our example application done. I hope these bones can serve as a starting point for your own applications built using PhoneGap mobile app development framework. At PopularOwl I’m currently working on one PhoneGap based project which consumes data from WordPress powered eCommerce site. Its an interesting experience and I’m planning to share it with you in the one or two posts here on htmlcenter site soon. Stay tuned! As a finishing note to these tutorial series I want to mention few things about PhoneGap project architecture and debugging. If you want to better understand PhoneGap application design I would strongly recommend video presentation by Christophe Coenraets. Several other useful links to keep you going. Template frameworks for PhoneGap applications (allows you to dynamically load html markup and keep it organized in separate files) – Mustache.js, Underscore.js. For front end check out Ratchet and TopCoat CSS frameworks. Finally you can find the source code for mobile app we have created during 4 tutorial parts on GitHub. This is by no means completed application but it might (and I hope it will) give you some thoughts and push to create and publish your own PhoneGap based applications. As always comments, questions and suggestions are welcome. great stuff for beginners. keep up the good work.